The Handy Start Menu is the perfect utility to maintain all our applications perfectly organised in the Windows start menu. 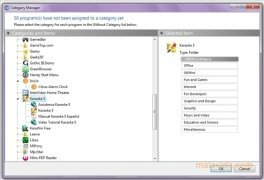 This tool recognizes the functionality of each one of the programs installed on our system and it classifies them according to the task that they carry out. Thus all games they will always be accessible from the same section, for instance. The program has a management zone from which we will be able to order each one of the applications manually, something that is perfect to be able to customize the arrangement of each one of our system's tools. 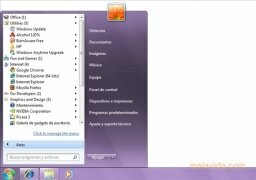 The program looks wonderful, because each one of the sections has its own icon, that provides the program's menu with a very elegant aspect. 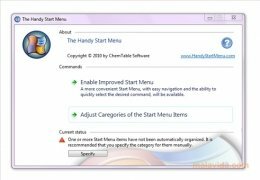 Few system improvements have ever been so eye-catching, as well as practical, so if you want to improve your Windows installation a little bit more, you shouldn't miss out on the chance to download and install The Handy Start Menu.